Check out some of our favorite new apps of 2016 and get inspired for your next build. As of today there are over 2.5 million apps in app stores across the web. This isn’t a huge surprise since last year mobile usage overtook desktop usage for the first time ever. Hearing this may seem overwhelming for those who aren’t yet in the mobile marketplace, but the good news is that as mobile usage becomes more commonplace, so is mobile creation. It is now easier than ever to build and publish a mobile app without investing huge amounts of time and money. Some organizations are building effective apps even in a matter of just 2 days. While it’s clear that anyone can now build an app, how to build a great app that actually gets used seems to be the million dollar question. In 2016 we saw over 30,000 guides get published on Guidebook’s Builder platform and we couldn’t be more proud. In an effort to help future guide builders, we decided to round up the best guides of 2016 to showcase the strategies, implementations, and best practices that all organizations should use. 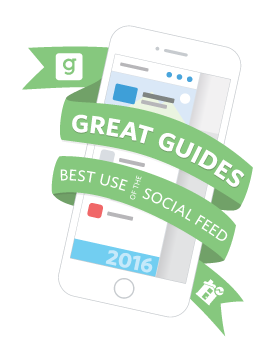 Here are our best guides of 2016 and some key takeaways. 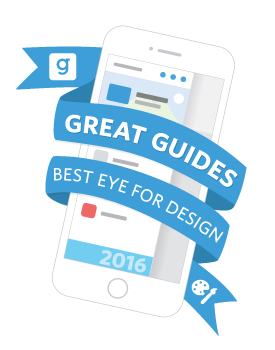 You can hear a detailed breakdown of each guide by the team in our Great Guides of 2016 webinar. Research shows time and time again that the campus tour is the single biggest factor informing a prospective student’s college choice. In a recent study, 65% of students claimed that the college visit was the #1 deciding factor for choosing a school. As a result, forward-thinking colleges like Santa Clara University are upgrading their tour experiences and it’s paying off. We’re giving our Best Campus Tour award to SCU in large part due to their innovative use of multilingual tours. In order to address the growing needs of an international student body, SCU created a great app that allows Chinese students to explore the SCU campus in their native language. As a result, the Admissions team saw a significant increase in student engagement and found an easy and effective solution to a traditionally costly process. SCU is a great example of how simple and easy it can be to make the admissions process more cost effective. If you want to find out more about how SCU used apps to improve their campus tour process, check out the full webinar we ran with SCU’s Admissions team here. According to a study by Common Sense Media, teens spend more time on their mobile phones and social media than anywhere else. The study finds that students not only turn to mobile social media to keep up with friends, but also to find a majority of the information they need. In order to meet students where they digitally live, University of Virginia created a Summer Orientation guide that used Guidebook’s Interact feature to provide students with a native social media network. The response that UVA saw from its incoming students far exceeded expectations. Over the course of the orientation process, UVA saw students log on to the guide app for several thousand sessions. The orientation app not only provided students with a sense of community, but it helped them answer each other’s questions and allowed administrators to help students in real time. When most people think about design they think about creating something visually pleasing, but rarely do they genuinely understand why some design works and some doesn’t. One of the best ways to ensure your app has good design is by concentrating on design functionality and the overall user experience. Navigation: Design is much more than just pretty colors. Great design allows users to get to information in the fewest clicks possible. When designing an app it’s important to cross-link information so users can navigate in multiple ways. Interests: Design should work for everyone. Star Wars Celebration did a great job of understanding the interests of its users and categorized its content to help each demographic find what they loved. So, while the autograph hunter could find all his signing opportunities, the selfie-taker could also find all her photo-ops with just the touch of a button. Icons: Having understandable icons is key to easy navigation. 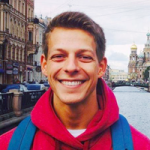 What’s great about Guidebook’s platform is it empowers both big teams and small teams equally. While a big brand like Star Wars can have full creative control over its brand, the Do-It-Yourselfer can also easily create branded icons with the icon builder template. Colors: Having a cohesive color scheme is key to looking professional. An easy way to take the guess work out of picking colors is by using Adobe’s color tool: Kuler, which allows you to find great color combos in seconds. Design is an incredibly important piece of the app building puzzle, and we don’t expect you to become an expert by reading this post. If you’re serious about improving the look and feel of your app though, consider checking out this webinar our Design team ran on app design. Using features like GPS directions, personalized schedules, and social interactivity, the event app gives event attendees a much richer experience than otherwise possible. 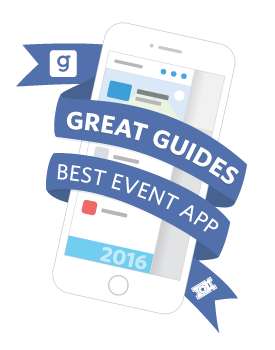 And getting the full benefits of an event app is often much simpler than it seems. One way that event planners can benefit from an event app is by using real-time analytics to provide attendees with what they need when they need it. Festival of Marketing’s use of Guidebook metrics allowed them to see which workshops were favorites at last year’s conference. They then went a step further and adjusted their resources to make sure that the most popular workshops were running smoothly and being promoted effectively. Using this simple feature, they were able to delight their attendees and create a successful event without spending a ton of money. After winning the nation’s “Most Outstanding Tried and True Program” award last year, NC State has decided to up the ante by creating a full campus-wide guide app. NC State’s campus-wide app stretches from career fairs, to orientation, to business school events, to academic advising, and beyond. By connecting these student experiences in one place it allowed their departments to be on the same page and work together as well as reduce costs. They eliminated duplicate work and can seamlessly provide students with the right resources to help them succeed. Check out this 6-minute video to learn more about their app. Destinations have been one of the most prolific adopters of guide app technology. Integrating an app into the destination experience is pretty easy and straightforward, but top-performing destinations know that there’s so much more that can be done. The London Transport Museum is a perfect example of just how helpful a guide app can be. They took advantage of features such as using push notifications to alert guests of promotions at the museum cafe, highlighting the best exhibits using teaser content, and even highlighting their gift shop in the app to drive more sales. Using the full set of features that Guidebook offers they were able to create several high quality touch points and their guest satisfaction surveys reflected this. The use-case for an event app has become pretty commonplace, so it’s no surprise that most associations have apps for their events nowadays. Event organizers have proven again and again that the return on investment is there and as a result most members expect to have an app to go along with their event. The place where ACUI really stood out is beyond the event space. Even though they had already built several successful event guides, they realized that they were missing a huge opportunity to stay in touch with their members in between events. Their innovative solution was to build a year-round resource guide that members can turn to at any time. This not only allows them to provide valuable information, but also gives them an opportunity to generate revenue using the donate and sponsorship features. As organizations grow, one of the biggest problems they face is how to provide individual attention to their multiple departments. With bigger teams and even bigger departments, things can get very complicated very quickly. But in a recent study, MIT found that companies who embrace digital transformation are 26% more profitable than their average industry competitors. The HR department at CA Technologies recognized this and took a multi-solution approach to this multi-point problem. They used Guidebook to create multiple guides to bolster internal communications and help each piece of HR function more effectively. By segmenting the different duties of HR they could provide more targeted solutions and reduce the overwhelm of running a large organization. CA Technologies proves that all groups in a growing enterprise can benefit by using one app, and Guidebook allows just that. One of the most common questions people ask us is how an app is different than a responsive website. The short answer is: using an app allows you to be far more helpful to your audience than with a website alone. You can bring people together through in-app chat or a social interactive feed. You can get feedback using surveys and easy-to-use metrics. You can even update your content to be relevant to your audience as the event develops. Or you can do all the above. With a recorded 26,000 downloads and over 1 million sessions, PAX is the ultimate example of the prolific impact an app can have on your event. PAX has been using Guidebook year after year and has mastered how to provide useful content for their guests. Their most visited features were the About section, Maps, Schedule, and Interact, which helped guests navigate the event all from one place. They also did a great job promoting the app which resulted in one-third of sessions coming in prior to the event. This meant that their attendees were well-informed and prepared for the event even before it began. Overall PAX knocked it out of the park and showcased just how much more an app can do over a traditional website. So that rounds off our best apps of 2016. We saw some incredible builds this year and way more than we could include in this short list. But if you’re interested in learning more about why each app made the list, feel free to watch our full Great Guides of 2016 Webinar here, and forward it on to others in your department who share your vision of a mobile future!